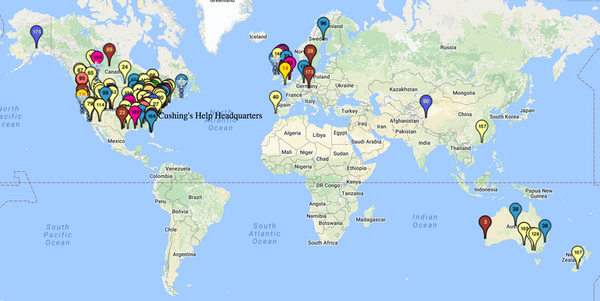 There are currently over 2,000 bios on the original Cushing's website and are slowly being converted to the newer CushingsBios.com format. Sharmyn had pituitary Cushing's and is in remission. This is a compilation of some of her interviews and videos. Sheryl is from Florida. Her journey started about 7 years ago with severe insomnia, muscle and joint aches. She was deteriorating so rapidly that I decided to go to LA and see Dr. Theodore Friedman (Dr. F). Barbara S is from Columbus, Ohio She has been experiencing symptoms since the mid 1990s. Barbara spent almost four years on high doses of steroids for a brain tumor, and had difficulty being weaned off. Nicole S (NicoleS) is from Toronto, Canada She is 37 years old and was diagnosed with Cushing's disease in May 2017 after suffering through a high risk pregnancy, early delivery and postpartum pain. She had a left adrenalectomy. Tim D (TimD) is from Middletown, Connecticut. He is glad he's finally getting tested since he's sure he has Cushing's. Michele M (Michele) is from Buffalo, NY She had her right adrenal gland and a pheochromocytoma removed. The Pathologist and endocrinologist diagnosed her with Cushings Disease. Stefanie is from Michigan She was diagnosed in 2012 and had pituitary surgery done 2013. She is currently on medications. Nicola C (Nikkikicks) is from Denver, Colorado She was in a car accident in 7/17 and had prednisone. That is when her symptoms started.